In July 2016 I published a post (which you can find here) in which I showed how much existing horizontal wells were going to produce in the future, if we would assume that their decline behavior would be similar to those of earlier wells. This post aims to achieve exactly the same goal, and uses the same method and presentation. The main difference is that I now can include wells that started before July 2016, instead of before Jan 2016, and that some improvements were made to the presentation. The first part of this post will provide a brief description of the results, and how to view them. Later, a more in-depth explanation is given that describes the method used, the differences with the previous result, and other remarks. How much oil production can we expect from existing horizontal wells over the coming years? How will existing wells decline over time, and how much oil will they each recover? How much oil have operators already produced from their existing wells, and how much is left? With which speed is all this oil recovered in each of the basins? To be sure, these results do not include any new production after June 2016, and therefore do not provide a full picture of total future production from horizontal wells. As usual, I haven’t included any vertical wells. For each of these three questions, a matching overview is available in the above interactive presentation. Let’s go over these views one by one. Here we can see the historical, and projected oil production from 56,641 horizontal wells that started production before July 2016 in the following states: Montana (since 2003), North Dakota (since 2005), Colorado, Wyoming, New Mexico, Texas and Wyoming (all since 2010). The view is split between June & July 2016, which is from where the projected production starts. 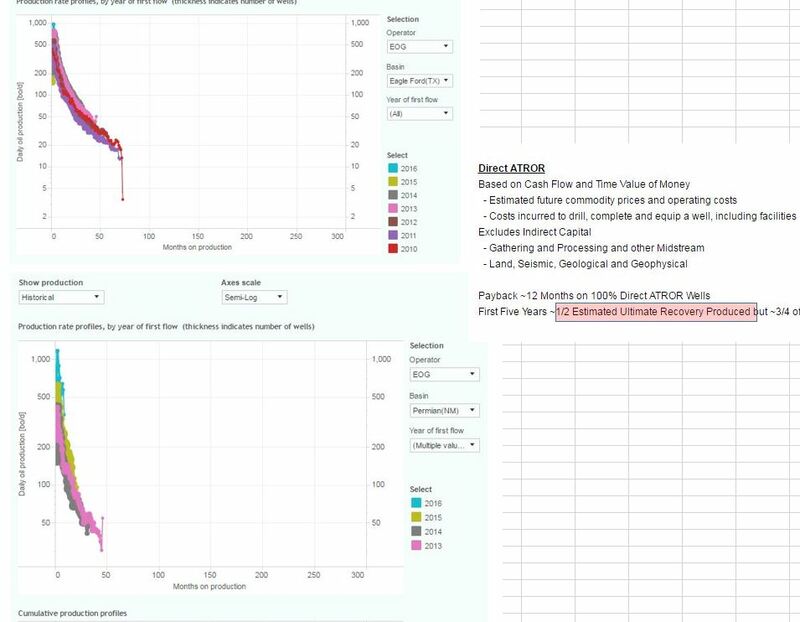 The average production rates, and cumulative production, for all these wells can be seen in the 2 graphs shown here. If you wish to see only historical, or projected production, you can use the “Show production” selection at the top. Historical production is marked with dots on the curves. It’s easy to see here that wells from the earlier years (<2010) display a slower decline than later wells, on average. These were wells in the Bakken region in Montana & North Dakota. If you click on a year in the legend, the related wells will be highlighted. 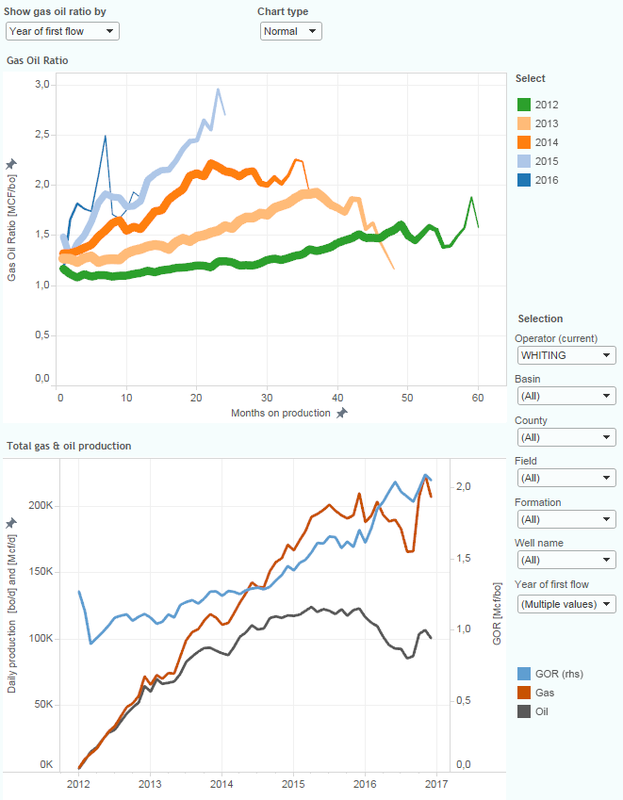 You may then see some overlap of the historical and projected production rate profiles; this is because wells are grouped by the year in which they started. A well that started earlier in a particular year will have more months of actual production data than wells that started production later in the same year, and therefore the projected output of this earlier well will start later. For the top chart, three ways to scale the axes are available. I have found that for different purposes, they all have their uses. The “Log-Log” setting will show a remarkable convergence of production rates, especially if you have selected “Historical” production only. 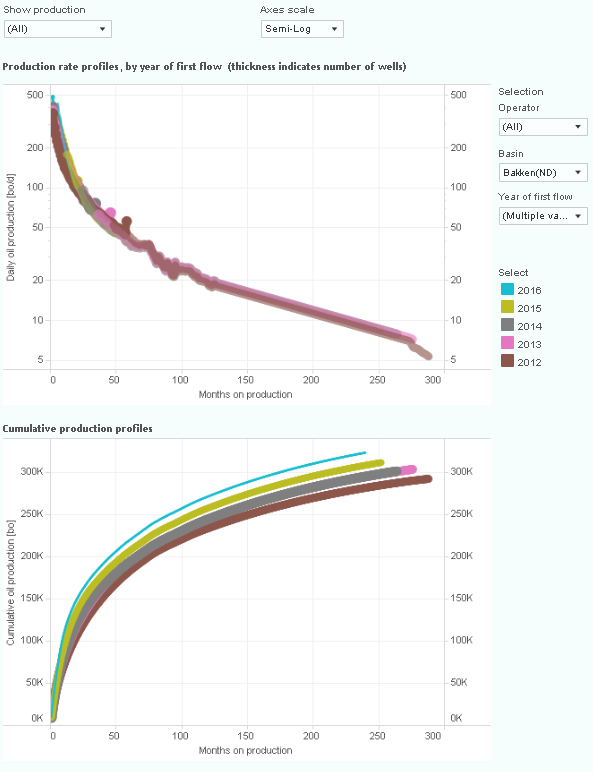 Here I wanted to share some insights into the total historical & projected oil production from all these wells. Both charts here use the production profiles, as seen in the previous overview. The top chart shows the (gross) total oil production for each of the 10 largest operators, and how much they already produced versus projected production. Just use the “Operator” selection if you wish to see other operators compared here. 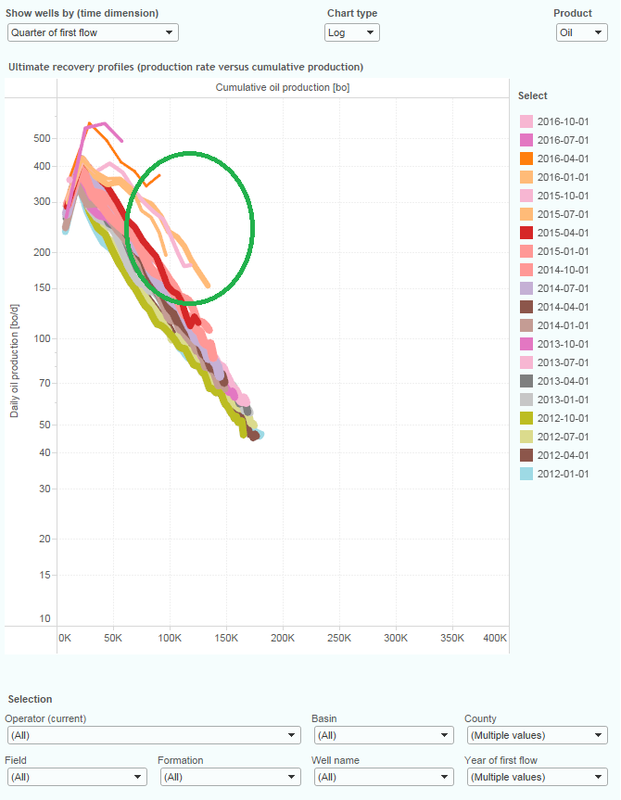 The bottom chart shows for all selected wells the estimated ultimate recovery (EUR), for each of the basins. The aim here is to show the differences in well EURs for each basin, but also how these recoveries are distributed over time. This latter can be seen by the colors used; for example, the blue color at the bottom is the portion that is recovered in the first year on production. As noted, I’ve estimated the future output of each individual well (in total 56,641 horizontal wells). Each of these wells started before July 2016, but I’ve used actual production data through October 2016. This way, for each well at least 5 calendar months of production history were available, which was used to estimate future production. The method used has not changed since the last version, but here follows a brief explanation of it. The key assumption on which the method is based is that the decline behavior of wells in each of the basins hasn’t changed materially. As I’ve shown in the previous posts, although there are significant changes in initial production, the decline behavior afterwards appears so far rather similar. For each basin, and for each well age (in months on production), I’ve clustered wells by their actual production rate. For each of these clusters, I’ve determined the average actual decline rate seen afterwards. To project the output for a well, the algorithm first searched for the matching cluster to which this well belongs, based on its age and production rate. Then, the decline rate that historically was seen for the wells in this cluster, was applied to this well. For far-out months, for which very limited data exists, I’ve used exponential terminal decline rates depending on the basin (8% for the Bakken, and 10% for the other basins). Also, I used an economical limit of 6 bo/d, after which a well would stop producing. These values are just estimates that I deem reasonable, but very limited data exists to support them. If you belief that other values for these parameters are more appropriate, you could estimate the adjusted results. Note that slightly different estimates for these terminal decline rates, and economical limits will not greatly affect these results, as most oil is recovered in the first several years, and for this period extensive data already exists. Decline rates are estimated based on all the wells in the basin, and not for the area (county/field/formation/depth). Basin-wide results will therefore be more accurate than more local results. I have not used any information on the completion methods used for each well, and therefore completely ignore this, while acknowledging that this may strongly effect individual well performance. Only the latest known production rate is used to determine which decline rate should be applied. 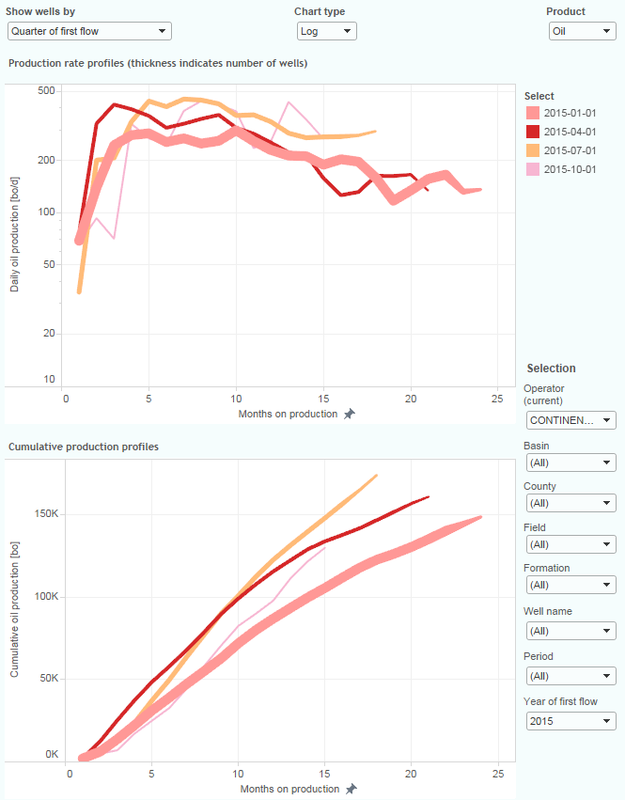 In cases where the most recently reported production rate is not a good reflection of the actual state of the well, the projected output will not be correct either. A small number of wells in these basins are gas wells, so they may still continue to produce even when their oil production has reached very low levels. This explains some of the (minor) sudden drop after October 2016; several wells that recently still continued to produce at low oil production rates would stop producing according to the method described above. This causes some downward bias. I’ve tried to exclude the results from refracking; wells that were refracked were not used to determine projected production declines for other wells. As operators may continue to refrack some of their wells, the future output is likely to be a bit higher than indicated here. Therefore, also this effect may underestimate future output from these wells a little. Wyoming has been added to this data set. In North Dakota, the data now contains wells from 2005 & 2006 as well. A few hundred wells in the Permian basin in West Texas were removed (7% of the total horizontal wells), due to low accuracy in estimating their individual production histories. As mentioned, wells that started in the first half of 2016 have now been added. Instead of using an economic limit of 8 bo/d in the Bakken, I used 6 bo/d now. The only reason I did this is to make it inline with the other basins, as I have no comprehensive data on this topic. I intend to regularly (maybe twice a year) revise this post, and then to compare the new results with the previous ones. Due to differences in coverage, as described above, the results are not exactly comparable. 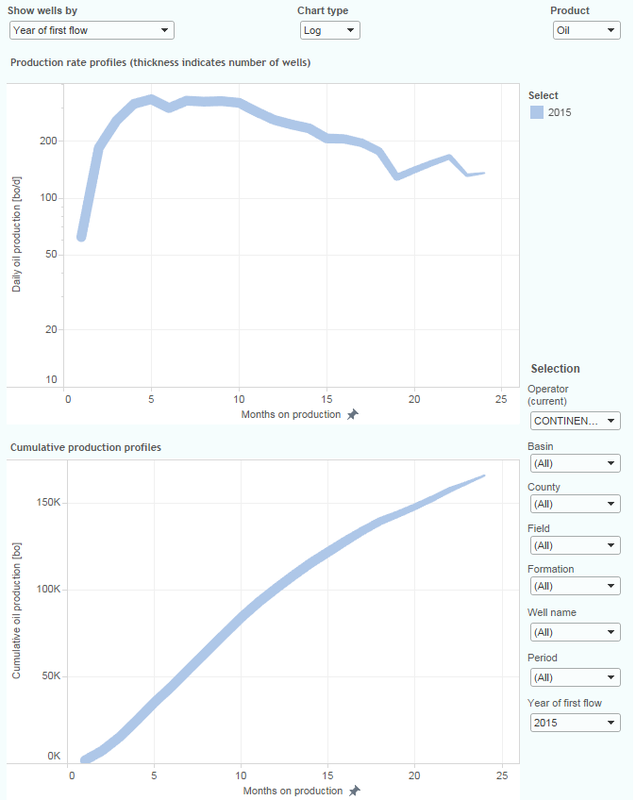 Despite that, you can see that the overall shape of the total production profile is very similar between both versions. In Jan 2025, the projected output of wells that started before 2016 is around 0.5 million bo/d, in both the new and the old version. In general, there appears to be a small downward revision of projected output, given that the new version contains more wells. The production peak in March 2015 is now higher at 4.17 million bo/d, instead of 4.0 million bo/d. This was historical data in both presentations, and this shows the effect of the overall increase of wells in the new data set. October 2016 production, which was projected in the previous version, and on which we now have actual data, is in the new version about 0.25 million bo/d higher (2.35 vs 2.1 million bo/d). Part of this can be explained by the increased number of wells, but I think that some of this higher production also comes from the higher initial production of the wells that started at the end of 2015, compared with earlier wells. Besides that, I noticed that in the previous version, my coverage of wells that started in the 2nd half of 2015 in Texas was not yet complete: if you select only the Texas basins, you’ll see that in Dec 2015 the production of these wells is now more than 0.1 million bo/d higher (almost 2.2 million bo/d, vs below 2.1 million bo/d in the previous version). I would like to thank Jim Brooker for reviewing several drafts of this new Projections presentation, and for providing several excellent suggestions. 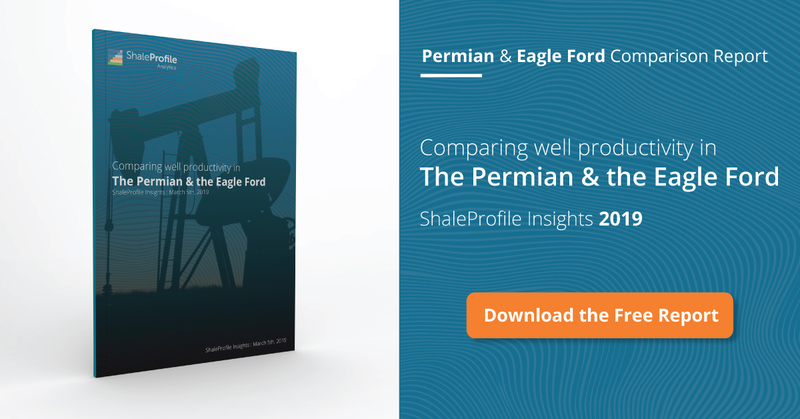 I’ve planned to publish a new update on the Eagle Ford by next week Tuesday, followed by one on the Permian. Texas Railroad Commission. I’ve estimated individual well production from well status & lease production data, as these are otherwise not provided. About 7% of the horizontal Permian wells in Texas are excluded, as these were mixed with too many vertical wells on a lease, making reasonable well profile estimations impossible. Tool tips are shown by just hovering the mouse over parts of the presentation. Appreciate it Dean, thank you. 2) all wells 2003 -> 2012 will produce on average less than 6 bpd by 2025. So they should all be excluded from a certain moment? In the end (2025) you have more than 50,000 wells producing less than 500,000 barrels per day. That is less than 10 bpd on average. Given the production of the median well is clearly below the production of the average well, the production of the median well might flirt with that 6 bpd treshold. So you need to cut away something like 50% of the thickness of the tail of your graph? More relevant is: you are projecting a loss in legacy production of around 1,800,000 barrels per day over the course of the next year! Awesome! To clarify; I don’t exclude these wells, but once an individual well hits 6 bo/d, the well stops producing in my projections. Their 0 production is still included in the averages, and that is why you don’t see the well count changing. The average can be below 6 bo/d, when part of the population of wells is at 0 bo/d, while another portion is still above the economic limit. Once all wells have reached this 6 bo/d level, the average indeed goes to 0. This is still not the case in 2025, and therefore you see indeed a total average production level of just below 10 bo/d per well. Did this clear things up? “It’s easy to see here that wells from the earlier years (<2010) display a slower decline than later wells, on average. These were wells in the Bakken region in Montana & North Dakota." I do think there are other possibilities, as these early wells were drilled into some very good locations (Cedar Hills, Parshall, Sanish). I hope there will be public studies on this topic. The limitations that come with Enno’s data are on the multi-well leases in Texas. But they are a limitation for everyone. So Enno must use an allocation algorithm, much like IHS must use an allocation algorithm for individual wells. Their constraint is of course every lease for every operator for every month must sum to that reported to the TRRC. The problem is when an individual lease is developed over multiple years, this breakout to the wells is a very difficult problem. I know something about each of the allocation algorithms, and they are quite different. So when a question like this arises, I run a quick table of IHS data and compare it to Enno. IHS has 85 Karnes county Eagle Ford wells operated by EOG with a production start date between 1/1/2013 and 12/31/2013. The average age of these well through dec production is 43 months. A table of these wells was averaged to give a current production of 46 BOPD, a cumulative of 200,655 bbls. Go to Enno’s eagleford page, pulled up Karnes County EOG, and I see a 43 month number of 46 BOPD, and a cumulative of about 201,000. Always good to see my numbers confirmed by somebody who takes the time to verify them. EOG is always on the sweetest of the sweetest spot it seems, for as large as they are it is quite remarkable. Going through their latest presentation, and noticed a footnote regarding their Direct ATROR calculation, which suggested that they assume “1/2 of the Estimated Ultimate Recovery Produced” in the first five years. Assume they mean that the other half is produced after 5 years. I tried to get Enno to reduce the scale on the well performance projection posts so one could more closely see “where the action is” to no avail. But it is amusing to graph historical performance for EOG wells on the 300 month scale. Below is a montage of their Eagle Ford, Permian NM, and the clip from the presentation illustrating that 1/2 the EUR occurs at five years. In my opinion, on average, over 90% of the economic recovery occurs in the first 60 months. He seems to have a different dataset, hasn’t he? 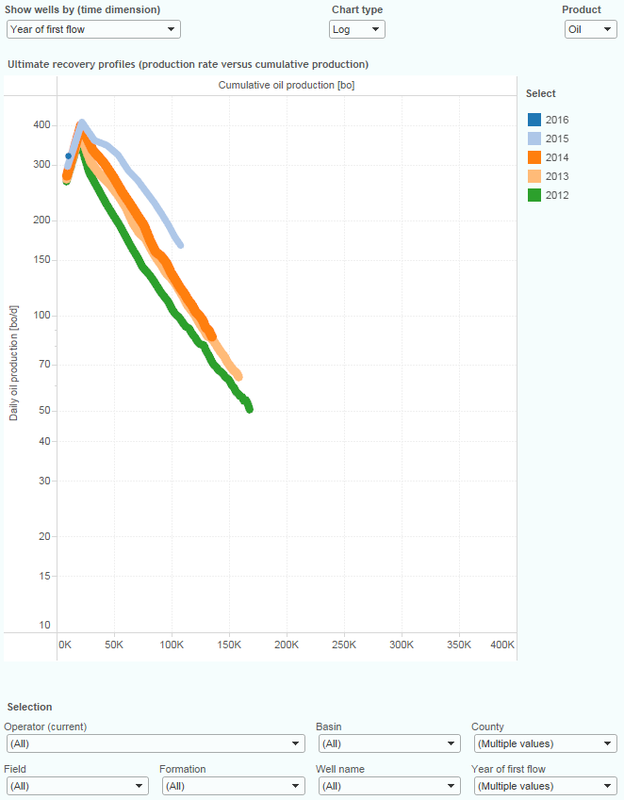 The argument that Art Berman makes in this article is that at least since 2015 the EURs for all major operators have declined in the Bakken, based on decline curve analysis. One of the reasons that I created this site just over a year ago, is to make it easy for anybody to verify any claims on US LTO production. In discussing these statements, I will show how I got to a certain chart, and I hope that at least some of you will try this yourselves. A difficulty here is that, except for my “Projections” posts, I refrain from estimating future production, as I prefer to focus on the hard, actual production data. 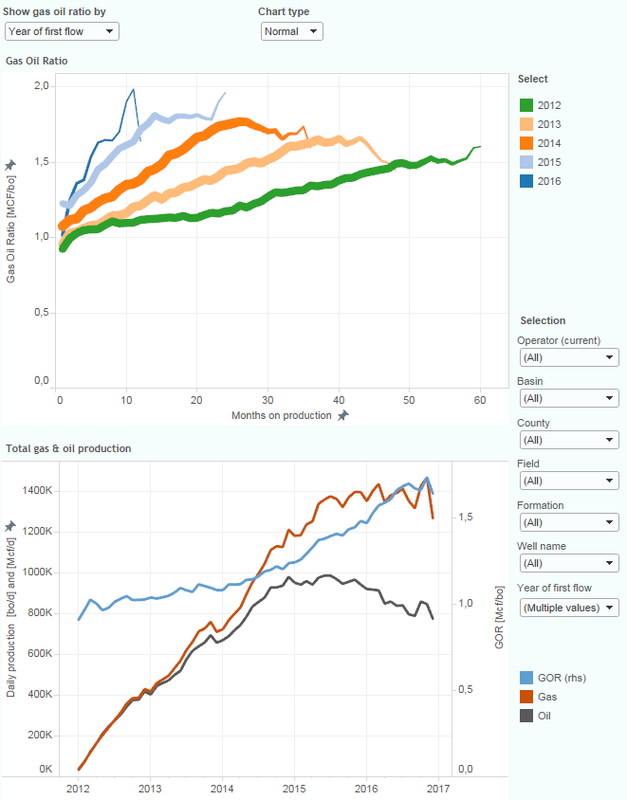 There are several ways to estimate future production, and these methods can lead to wildly different outcomes, based on the assumptions, and parameters used. I will give my detailed response now spread over multiple comments, as I would like to use multiple images, and there is a limit of 1 per comment. Let’s see what the data shows so far for ND. Hi Enno, thanks a lot for your comments. I really appreciate them. This shows that also for Continental Resources well results changed significantly over 2015. The fat line at the bottom shows that, just after the oil price crash (in early 2015), a large number of wells were still completed, but in the next few quarters, far fewer wells were. Those later wells also performed better, most likely high-grading had some effect here. –	Due to the lower performance of the early 2015 wells, the performance in the last few months on production (15-23) is too low. This will greatly affect the outcome of the decline analysis, and that in my mind is a significant factor behind the far lower b-value (0.2) in his result for Continental’s 2015 wells. The way to avoid this issue, is by ignoring the data points that not all wells reached yet (everything after 13 months on production). That is exactly why I do so in the “Ultimate recovery” overview. I already showed that this is not only the case for Continental Resources, but as the average for ND shows, for many operators in ND. I would recommend to redo this study, by excluding those incomplete months. My guess is that the outcome would be rather different. This was my main argument. In summary: It may not be a problem to use the early wells in a certain group to estimate how a later set of wells will perform, if all these wells behave rather similarly. But in the case of 2015, during which great changes played out, it is incorrect to assume that the later 2015 wells, for which still less production data is available now, will behave similarly as the earlier wells. In fact, I’ve shown that the small number of wells that started in the 2nd half of 2015 perform quite a bit better than the large number of wells, that started in the 1st half. From the slide it appears that Art Berman did make the assumption that there were no such changes during 2015. I belief that the analysis method he used is very sensitive to these kind of errors. 2. Art Berman shows that GOR has fallen in 2016. For Whiting he shows a very significant drop. In the following pictures I show how GOR has developed in ND as a whole, and for Whiting. From this, I don’t see that GOR is down significantly. I am surprised about this, as the basic data that all analysts use should be rather similar. It would be interesting to understand these differences. We are getting to the point in the Bakken where the GOR versus cumulative oil may prove interesting. With increasing early rates, the GOR versus time behavior observed is not verifiable proof of pressure depletion, as the curves seem to originate in approximately the same spot. GOR versus cumulative oil would account for the pressure drop due to the well’s oil voidage, which would allow for a better comparison of well interference/depletion over time. That looks close enough to his chart. Note that he uses monthly production rates, while I calculate the daily production rates. This should be a little bit more accurate, given the different number of calendar days in different months. This may seem unimportant, but as not much data is used, minor differences here can already impact the results of decline rate analysis significantly. Note also that, as usually in this chart, the curves are thinning near the end. The reason is that not all the 2015 wells have gone through all those 24 calendar months on production yet. The ones that started in December 2015 have only 13 calendar months under their belt as of the latest NDIC report (for Dec 2016). Do the wells in this group behave quite similarly? We already saw in 2nd picture above that wells in ND, from the 2nd half of 2015, behave quite differently. Admittedly, I use a rather simple procedure, whereby I let wells decline based on what wells with similar rates at similar ages did in the past. It could very well be that the method that Art Berman uses is better. I just wanted to show here that my method does lead to a different result; 2015 & 2016 appear to lead to slightly better EURs eventually, where most of the increase happens in the first few months on production. Art Berman doesn’t show in detail how he got his results, except for Continental Resources for 2012 & 2015 vintages. Looking at those slides, you can see that his model leads to a b-factor of 0.2 for 2015 wells, while it was 1.3 for 2012. Anybody who is a little bit familiar with decline analysis knows that these different values lead to wildly different outcomes. Therefore, it is important to understand this result. Looking at the chart, you’ll see that 23 months of data were used to generate these outcomes. Now we see the averages per quarter, instead of by year. The green circle marks the performance of wells since July 2015. 1. There appears to be a sharp difference in performance of wells that started production in the first half of 2015, and those that started later. 2. The wells that started later are lower in number (as marked by the thinner lines), but appear to be doing better so far. Are these later wells declining sharper than earlier wells? I don’t see it (yet). This shows that 2015 wells have on average a higher cumulative production, compared with earlier vintages, at similar levels of production rate. Are they heading for a lower ultimate recovery? It could be, but I would argue that is not clear from this view on the data. Let’s have a closer look at this data. Because this view excludes production data for wells, if not all the wells in that group (e.g. starting in 2015), reached a certain age (in months on production). You will see more recent data by grouping by quarter or month. The nice thing about your ultimate recovery graphs is that a harmonic decline (b=1) is a straight line here. A b>1 is concave up, and a b<1 is concave down. The above shows an excellent example of the green early curve showing more concave up behavior, the tan curve a little less, and the orange curve starting to go concave down. Not anything like a dramatic 1.2 to 0.3, but changing behavior nonetheless. The jog in the 2015 curve looks like an early time (6 month)highgrading shift- which you explain very well to me, following what I would consider to be more concave down behavior. Eight people sent me that Berman article. I skimmed it because I knew the headline conclusions were wrong on the basis of your data. Everything you say makes excellent common sense since the first half 2015 wells were likely largely underway prior to the October 2014 crash. Then the highgrading starting. Great site, charts and data. Enno I wonder if you could answer this question so the we/I can get some perspective on the weekly Baker Hughes data. Using an average US well or a slightly optimistic number for its first month production, how many new wells per month are required for the next few months to keep US production flat. I say next few months since I assume that the decline rate continues to change as wells are added. My idea is to multiply the number of rigs by 1.5 to see how many wells those rigs can drill and compare it with the number you might hopefully provide. Unfortunately, that is not an easy question to answer. It requires some notion about how many wells each rig in each area can drill, and how much oil those wells will deliver, as well as how current wells are going to decline. To further complicate the story, you may have changes of the DUC inventory. Even if you had all that, you still have rather big monthly fluctuations, due to external factors like weather. Tough. A simpler, but in my mind still very interesting question, is how much daily oil production these rigs could sustain (indirectly of course), in the long run. You can then ignore the inventory issue, and the effect from existing wells. You only need to multiple the rig count, with the number of wells each rig can drill per day, and with the expected oil UR for each well in each area. E.g. a simplified example just to illustrate : 45 rigs in ND, times 0.05 wells per day per rig, times an estimate average oil UR of 300 kbo per well, can sustain a daily oil production in the long run of 675 kbo/d. Not easy (even when all these factors are constant, which they are not), but doable at least to get a ballpark figure (though only for horizontal wells on which I have that data). No plans yet to work on this. Thanks. Did not realize it would be that difficult. My intention was to get a short term projection, i.e. a one to two month projection to avoid the issue of declines. I imagine that more wells would be needed each month as declines from earlier wells increased. The talking heads on the TV announce the number of rigs and then say production is climbing. In fact lower 48 state minus G OF M is actually still in decline. Most of the gains have come from the G of M.
I think the EIA overshot the original decline. They had a drop of over a million per day for the US when Enno’s data would indicate a 300 Kbopd drop late summer 2016. A poster on a message board I frequent caught this in their weekly adjustment factor and said they were understating production greatly. In general, they try to predict into the future too much and they overshot the downside now they have to increase to match reality. So everyone believes production is increasing because they are the authority. If this isn’t a reasonable explanation for what has happened, I’m all ears.